Since its birth, the nuclear industry has been beset by a number of intractable problems, among them its propensity to produce an ever-growing mountain of radioactive waste that nobody really knows what to do with for the very long periods of time that it will remain dangerous. Our very own state-owned Nuclear Energy Corporation (Necsa) thinks it’s found the solution for 36 000-odd bits and pieces of atomic scrap metal at its notorious Pelindaba site near the Hartbeespoort Dam, about 30 kilometres west of Pretoria: melt it down in a smelter. If that sounds like a somewhat dubious idea to you, you’re not the only one. A number of environmental organisations and residents’ groups have raised serious concerns about the project, which has been on the cards for years without ever really attracting a whole lot of media coverage. Necsa has applied for a Nuclear Installation Licence from the National Nuclear Regulator (NNR) for the construction and operation of the smelter facility, and some observers believe that it will be issued shortly. As taxpayers, we should certainly be concerned about the estimated R20m which is about to be spent on a questionable attempt to clean up the remains of apartheid’s toxic A-bomb mess. Over the years, Necsa has accumulated some 14 000 tonnes of waste metal “lightly” contaminated with uranium. About 70% is steel, the rest is aluminium, copper, brass, nickel, cast iron and bronze and almost all of it comes from the decommissioning of uranium enrichment facilities at Pelindaba, the place where South Africa’s atom bombs where developed, built and stored. Necsa’s plan is to melt all of this metal down in an induction furnace using crucibles with a capacity of 1500 to 4000 Kg per load, expecting to process all of the material over a period of about ten years. Approximately 98% of the uranium currently contaminating the metal will concentrate in the slag when it’s melted. This slag will be sealed in drums and eventually stored at the national nuclear waste site at Vaalputs in the Northern Cape. According to Necsa the recycled metal will only contain about 1% of evenly distributed uranium once it’s passed through the smelter, making it clear for “release” onto the market. Not my kind of recycling, to be honest (mental note: check ingredients next time you buy a new frying pan). The remaining 1% of uranium will be “available as off-gas” which will pass through a filtration system capable of removing more than 99.9% of it. The amount released into the atmosphere will be well below the allowable limit and “the environmental impact will therefore be insignificant”. So says Necsa. – Waste incinerators are notorious health and environmental hazards, potentially generating toxic compounds and particulate matter that are difficult to confine. – Necsa has contracted a controversial Swedish company called Studsvik to help with the design of the smelter, but Studsvik had a complaint of criminal negligence filed against it in 2007 when their bid for a similar smelter was scrapped in the US, allegedly for deliberately failing to follow regulations. – The NNR does not have the technical or financial capacity to regulate a facility such as this. – Radioactive smelter projects have a poor track record worldwide, with a number having been shut down as a result of public pressure and successful litigation. – Experts have expressed serious concerns about the safety and effectiveness of the so-called HEPA filters which are to be used to remove uranium from the smelter off-gas. – Necsa has refused to consider alternatives, like encapsulating the waste and storing it in a sealed building on site. I for one don’t like Necsa’s neat little plan for using taxpayers’ money to invest in highly contentious and potentially dangerous technology for cleaning up a nasty mess that the vast majority of us would not have allowed ourselves to get into had we ever been given the choice. How about you? Posted by Andreas in "The Economy", Column, Environment, Nuclear Power, Politics, renewable energy, South Africa. If government gets its way and goes ahead with building six new nuclear power plants (NPPs), the potential for graft and corruption will make the arms deal fiasco look like a silly squabble over small change. Tenderpreneurs and kleptocrats throughout the land must be licking their lips at the prospect of having their palms, wallets and bank accounts royally greased. There are many good reasons why nuclear energy is not a good option for South Africa or anywhere else: the health risk associated with NPPs, the waste which remains lethally radioactive for thousands of years and for which nobody has found an acceptable storage solution, the threat of terrorist attack and nuclear weapons proliferation, the fact that uranium fuel is neither inexhaustible nor carbon-neutral, and more. But for those of you who aren’t convinced by these bunny-hugging and touchy-feely sentiments, the clincher should be the fact that nuclear power simply makes no economic sense. The nuclear industry cannot survive without the financial support of the state anywhere in the world. Of the $151bn in government subsidies for the US electricity industry between 1943 and 1999, more than 96% went towards nuclear power. Since the early 1980s the US government has sunk over $90bn into developing a nuclear waste storage facility at Yucca Mountain in Nevada without success. In the UK it is estimated that decommissioning of the previous generation of British nuclear plants and their accumulated waste will cost £72bn or more in taxpayers’ money. In February, having spent more than R8bn with absolutely nothing to show for it, our own government finally decided to cut financial support for the ill-fated Pebble Bed Modular Reactor project. Since the start of the so-called nuclear renaissance in the early 2000s, projected costs for new NPPs have increased two- to four-fold. Their construction is notorious for being over budget and delayed. By the end of last year, the Finish NPP being built on Olkiluoto Island by French state-owned multinational AREVA – a main contender for the South African nuclear bid – was more than three years behind schedule and at least 75% over budget. The only other NPP under construction in Western Europe at Flamanville in France is at least 20% over budget and two years behind schedule. In an independent analysis of the South African situation, Rod Gurzynski has recently estimated that the total cost of a 1600MW NPP would come to around R100bn “all-in”. Among a number of criticisms, he points out that the consultants’ report on the cost of nuclear energy which was commissioned by the Department of Energy for the government’s 20-year Integrated Resource Plan does not seem to consider decommissioning costs or long-term high-level waste management and storage costs and therefore paints an entirely unrealistic economic picture. Last month, researchers from Duke University in the USA showed that in North Carolina, which is nowhere near as sunny as South Africa, it is now cheaper to generate electricity using photovoltaic solar panels – possibly the most expensive of all renewable energy options – than by building new NPPs. So why are we still wasting time and money on even considering nuclear power as an option for South Africa? In 1994, Trevor Manuel, then heading the ANC’s economic desk, said: “we shall not tolerate circumstances in which policy on issues as critical as a nuclear programme be confined to experts in dark, smoke-filled rooms.” In reality, however, that’s exactly how decisions are being made. A small but powerful lobby of special interest groups, including the nuclear industry itself, has the ear of the powers that be and we’ll have to shout a lot louder or we’ll all be burdened with an entire herd of radioactive white elephants soon. Posted by Andreas in activism, Environment, Nuclear Power, Politics, Press Release, South Africa. Earlier today, fourteen members of Earthlife Africa ( Johannesburg ) were illegally arrested for participating in a legal picket in front of the Department of Energy’s (DoE) IRP2 Public Hearing in Midrand. The fourteen have been charged with ‘illegal gathering’ and ‘public indecency’ and are presently being held at the Midrand Police Station. Despite the fact that according to the Gatherings Act of South Africa, any gathering of less than 15 people does not require prior ‘approval’ from police, Earthlife Africa (Johannesburg) had applied for and received, written approval for the picket from the JMPD several days ago. Nonetheless, when the activists began their picket – to protest against the DoE moving forward with further coal-fired power generation projects and its stated intent to expand South Africa ’s nuclear power generation – they were summarily arrested by Midrand SAPS and forcibly carted off to the police station. Evidently, the charge of ‘public indecency’ was applied because the picketers were wearing bright clothing! Posted by Andreas in Climate change, Column, Environment, Global warming, Nuclear Power, Politics, rant, renewable energy, South Africa, Sustainable Living. Whose electricity is it anyway? At this very moment, wide-ranging decisions about South Africa’s energy future are being made. Decisions that will have major impacts on the environment and on the ecological legacy we’ll leave to future generations. But who is making these decisions? Government is working on an “Integrated Energy Plan”, a “Climate Change Response Policy”, the second “Integrated Resource Plan” (IRP2) and the establishment of an “Independent Systems Market Operator”. If you’ve heard about any of these, let alone understand what they involve, you belong to a privileged minority. In reality, of course, the process has been about as consultative as the Spanish Inquisition. Official documents and procedures are steeped in impenetrably technical and bureaucratic jargon and government has done precious little to inform ordinary people about the issues involved or the fact that they have the right to participate in the debate. Even dedicated NGOs have found it prohibitively difficult to properly engage with and respond to government’s proposals in the very limited time granted them. And when they do formally submit contributions – some 300 civil society comments have been submitted for the IRP2 – only a tiny minority is actually taken into consideration while the majority is simply ignored. Official attempts to co-opt a few hand-picked NGOs amount to little more than trying to legitimise what remains a deeply undemocratic process. If you’re tempted to think that at least the so-called representatives of South African voters have more of a say in what will go into the IRP2 than civil society at large, you’re sadly mistaken. Parliament has only had a single meeting about the IRP2 and with the exception of a few notable rebel voices, the people’s paid deputies have remained shtum on the issue. Yet we are told that a draft plan is already in circulation within the Department of Energy. So who is calling the shots? Would you call me a conspiracy theorist if I told you that our country’s energy future is being substantially determined by what is overwhelmingly a small group of powerful men representing the very same interests that have landed us in the mess we’re in today and made us one of the most carbon-intensive countries on the planet? The crucially important technical advisory panel for the IRP2 consists almost exclusively of Eskom technocrats, state apparatchiks and representatives of South Africa’s most wealthy, energy- and carbon-intensive industries with virtually no delegates from civil society or labour to speak of. And they call this democracy. Looks more like oligarchy – rule by an elite – to me. So here’s a challenge to Minister Peters: It’s not only your moral and ethical duty to comprehensively inform and consult the general public about the IRP2 process and enable them to participate in it actively, but also a precisely defined legal obligation. There is absolutely no reason why, given good information and the opportunity to engage in robust debate, ordinary citizens should not be capable of collectively making sound decisions about their own energy future. And the rest of us? Let’s become active citizens and citizen activists. Let’s support and join the organisations that are trying to give voice to public concerns in the energy debate. If we don’t, we’ll simply get railroaded into more of the same old non-solutions: laughably insignificant commitments to renewable energy, more CO2-spewing coal power stations and more dirty nuclear energy. Posted by Andreas in bees, Climate change, Environment, Film screening, Nuclear Power, Sustainable Living, University of Cape Town. While You Were Sleeping and the UCT Green Campus Initiative invite you to watch four fantastic documentaries with important environmental themes at the Labia on Orange cinema in Cape Town from Monday 20 September to Thursday 23 September at 6.15pm. You can’t afford to miss these thought-provoking and inspiring documentary films covering themes from nuclear energy and over-fishing to oil pollution. An eye-opening account of the truth behind the world-wide decline in honeybee populations. Known as Colony Collapse Disorder, this phenomenon has brought beekeepers to crisis in an industry responsible for producing apples, broccoli, watermelon, onions, cherries and a hundred other fruits and vegetables. Commercial honeybee operations pollinate crops that make up one out of every three bites of food on our tables. Filming across the US, in Europe, Australia and Asia, this documentary examines the alarming disappearance of honeybees and the greater meaning it holds about the relationship between humanity and nature. As scientists puzzle over the cause, organic beekeepers indicate alternative reasons for this tragic loss. Conflicting options abound and after years of research, a definitive answer has not been found to this harrowing mystery. In a world living in fear of climate change and global warming, the nuclear industry is proposing itself as a solution. It claims that nuclear power generation produces zero carbon emissions. Is it time we learned to love the split atom? Or is there a risk that we might be jumping out of the carbon frying pan and into the plutonium fire? The Nuclear Comeback poses the question of whether, by seriously considering the renewed development of nuclear power, we may be gambling with the very survival of our planet. Imagine a world without fish! The End of the Line is the world’s first documentary about the devastating effects of overfishing. Filmed across the world – from the Straits of Gibraltar to the coasts of Senegal and Alaska to the Tokyo fish market – featuring top scientists, indigenous fishermen and fisheries enforcement officials, The End of the Line is a wake-up call to the world. An inside look at the infamous $27 billion “Amazon Chernobyl” case. Three years in the making, this cinéma-vérité feature from acclaimed filmmaker Joe Berlinger is the epic story of one of the largest and most controversial environmental lawsuits on the planet. Crude is a real-life high stakes legal drama, set against a backdrop of the environmental movement, global politics, celebrity activism, human rights advocacy, the media, multinational corporate power, and rapidly-disappearing indigenous cultures. Each screening will be followed by a facilitated audience discussion. Tickets are R20 and can be reserved by calling The Labia at (021) 424 5927. Reserving tickets is strongly recommended to avoid disappointment. This event is presented by the UCT Green Campus Initiative, the Labia and While You Were Sleeping, a Cape Town-based non-profit film collective committed to bringing progressive, non-mainstream documentaries with important social and environmental messages to South African audiences. Posted by Andreas in Cape Town, Environment, Nuclear Power, South Africa. The draft environmental impact report (EIR) for Eskom’s proposed Nuclear 1 project is available for public comment until 31 May 2010. Eskom is trying to get approval to build new nuclear power stations at three sites (Thyspunt in the Eastern Cape, Bantamsklip in the Western Cape and Duynefontein next to the existing Koeberg plant near Cape Town). You can find the entire report here. This report is incomplete, scientifically flawed and presents, by its own admission, data that are not in conformance with the latest internationally accepted practice. The (anonymous) authors of the report nevertheless proceed to use these insufficient data to conclude that “the seismic hazard does not preclude a standard export NPS (nuclear power station) at any of the proposed sites”. They appear to come to a preconceived conclusion in the face of their own contradictory observations. The report seems to have nothing to add to and in fact appears to rely on and revisit the results of a previous report – the Specialist Study: Geology and Seismic Hazard, Council for Geoscience Report number: 2007-0277 which was part of the Pebble Bed Modular Reactor Demonstration Power Plant (PBMR DPP) Environmental Impact Assessment and Environmental Management Programme. Question: Has any new and additional work (theoretical or field-based) been carried out since the PBMR DPP report or is the current report based on the results presented in that report? Considering the importance of a thorough seismic evaluation of any site for an installation as potentially hazardous as a nuclear power plant (in the words of the report itself: “’Local vibratory ground motion’ resulting from geological-related seismic events (fault rupture), which, in terms of potential consequences, constitutes the most serious geo-scientific threat to a NPS”), this report is highly problematic and its recommendations and conclusions are, at best, questionable. My comments focus particularly on the assessment of the Duynefontein site, but the majority are generally applicable to all three proposed sites. The fact that the source (fault) responsible for this historic earthquake has not been identified with certainty does in no way preclude a recurrence of a similar event in future and neither should the fact that it took place over 200 years ago inspire any confidence since such a time period is practically instantaneous in geological terms. The important conclusion, studiously avoided by the report’s authors, is that there is no reason to believe that major earthquakes will not happen in the close vicinity of the Duynefontein site again. Where the PBMR DPP report called for ”detailed work” that “will have to be undertaken” to resolve “the questions around the 1809 to 1810 seismic events and the existence of the Milnerton fault”, the current report acknowledges that “no new research has been performed to confirm or refute the presence of the fault or its point of closest approach to the site”. Question: Why has no new detailed work been done to resolve this issue as recommended by the previous PBMR DPP report? The report is remarkable for its extreme sparsity of quantitative scientific data. While qualitative and observational data is, of course very valuable, for a report of as much significance as this one, the presentation of more measurable quantitative information would have been of paramount importance. The fact that this seismic hazard assessment includes only a single quantitative measure is worrying. Question: Why were no additional quantitative parameters of seismic risk assessment determined? The only quantitative assessment of seismic risk included in the report is thus not in conformance with accepted international standards. Question: When will “a new and advanced Probabilistic Seismic Hazard Analysis (PSHA)” following “the latest internationally accepted practice” be undertaken? For what they are worth, the PGA values cited in the report are quoted to an accuracy of two decimal places. While the report makes a point of highlighting that the study of seismic phenomena is subject to substantial degrees of uncertainty, associated with both the apparent randomness of the physical processes involved in earthquakes and the seismic waves they generate (this is referred to as aleatory uncertainty) and the lack of sufficient data and knowledge (epistemic uncertainty), no indication of the statistical uncertainty associated with the quoted PGA values is given. Without knowledge of the associated uncertainty, however, these values become questionable. This is particularly significant in the case for the Duynefontein site for which the quoted PGA value of 0.30g is identical to the value “typically used in the seismic design of NPSs”. The mathematical error associated with the PGA values may, for all we know, take them significantly above this “typical” threshold. Not quoting mathematical error limits with the only quantitative measure cited in the entire report is scientifically sloppy at best. Question: What are the errors associated with the PGA values quoted in the report? It should also be noted that reference to a “typical” value for “the seismic design of standard export NPSs” is not particularly enlightening, especially considering the fact that the specific design for Nuclear 1 is yet to be decided upon. This is particularly worrisome for all three sites, but especially for the Duynefontein site where the PGA value is already on the threshold “typically used in the seismic design of NPSs”. According to the report’s own observations the PGA values for all three sites may potentially rise above the 0.3g threshold once internationally acceptable methodology is used to recalculate these parameters. Question: What is the reason for the discrepancy between the PGA value of 0.27g quoted in the PBMR DPP report and the PGA value of 0.30g quoted in the current report? Was the PGA value of 0.30g in the current report determined using different methodology and/or data than the value of 0.27g from the PPMR DPP report? The error quoted in the PBMR DPP report is significant since it pushes the potential PGA value to a maximum of 0.41g which is substantially higher that the threshold of 0.3g “typically used in the seismic design of NPSs” according to the current report. If the error associated with the PGA value of 0.30g presented for Duynefontein in the current report is comparable, the maximum PGA value would be pushed to an even higher value of 0.44g. It is, however, entirely unclear how these engineers would be able to determine what would constitute “appropriate” seismic design criteria based on data that do not conform to international standards. References to additional future studies are of little use in the context of assessing the value of the current report. Considering the importance of a thorough assessment of seismic risk for the siting of a nuclear power plant, this report should urgently be subjected to a rigorous peer review process during which it (as well as all available raw data and detailed expositions of any methodologies employed) would be scrutinised by several independent and disinterested seismologists and geotectonicists of international reputation. As it stands the report expresses merely the opinion of its authors and it would not even be considered for publication in an internationally recognised scientific journal. Why should it be sufficient or acceptable as a basis for a decision that may affect the lives and livelihoods of several generations and the health of large stretches of the natural environment? Considering the information and observations presented in the report itself, the key conclusion drawn by its authors comes as a major surprise. It would appear that they arrive at a predetermined conclusion regardless if it contradicts some of their own observations noted in the report and some of which I have discussed above. The report uses outdated methods to calculate a single quantitative measure to assess the seismic risk associated with each of the three proposed sites. The best that can be done using this flawed scientific data is to rank the three sites in an at best semi-quantitative manner – thus the identification of Thyspunt as the preferred site. These data cannot, however, be used to assess the actual seismic risk at the sites on the basis of internationally acceptable scientific methods (even at Thyspunt, the flawed data cannot be used to discount the possibility of possible significant seismic risk). The key conclusion cited above is therefore all but meaningless until such time as data that are consistent with international scientific norms are available. Quite contrary to the official conclusion, the precautionary principle – a principle that must be applied when assessing technology as sensitive and potentially dangerous as nuclear energy – suggests that on the basis of the information presented in the report, the Duynefontein site should not be considered as a suitable site for a nuclear power plant until scientific evidence suggesting otherwise can be presented. 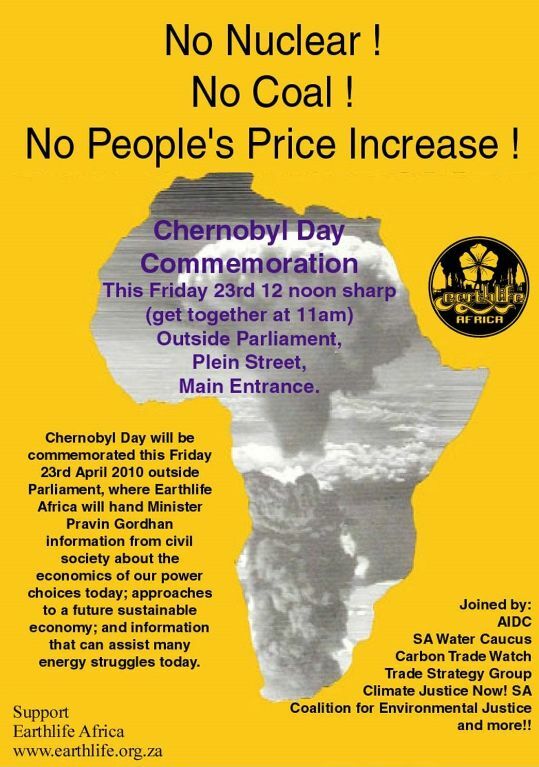 Posted by Andreas in activism, Cape Town, Environment, History, Nuclear Power, South Africa. When Eskom appeared to stop it’s plans to build more nuclear power stations in South Africa at the end of last year, those of us who oppose this expensive, dangerous and environmentally costly form of electricity generation heaved a big, but temporary sigh of relief, knowing perfectly well that the monster would be back soon enough. So here it is: the national power utility is hoping to build not one, but three new conventional atomic power plants. asking to be allowed to combine authorisations to develop Nuclear-1, Nuclear-2 and Nuclear-3 power stations at all three coastal sites earmarked for the nuclear programme. The three sites are Bantamsklip near Pearly Beach in the Overstrand, Thyspunt near Oyster Bay in the Eastern Cape and the Koeberg site of Dynefontein 30km north of Cape Town. At the start of the environmental impact assessment (EIA) the three places were to be assessed as alternative sites for the proposed Nuclear-1. […] The application includes the “roll-out dates” for the first three nuclear power stations: site preparation for Nuclear-1 will start in January next year and the nuke will come online in July 2018; site preparation for Nuclear-2 will begin in January 2013 and come online in July 2020 and Nuclear-3 site preparation start in January 2015 and come online in July 2022. If you’re looking for a juicy project encompassing both politics and the environment into which to sink your activist teeth, helping to stop this lunacy should be near the top of your agenda.